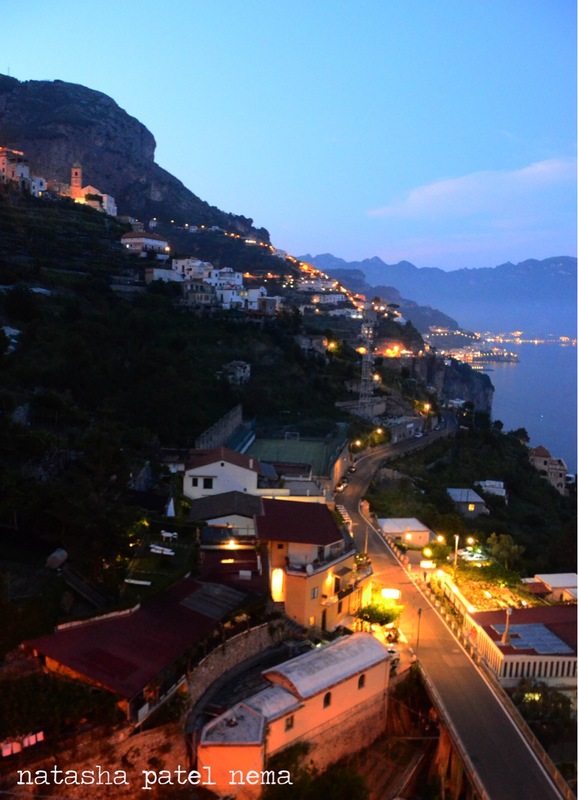 One summer we were on a family holiday to Amalfi. 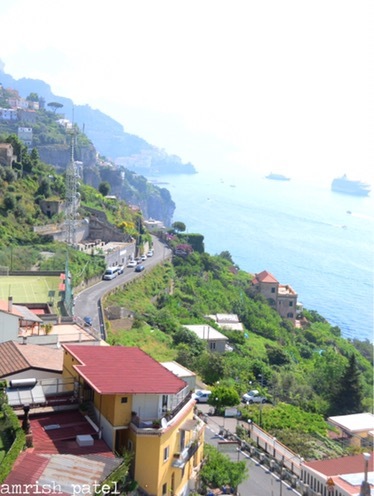 On the way to amalfi, the road was up hill and circling, suddenly my 17 month old son started screaming and crying, apparently he was feeling sick due to the road. He vomits on me, on the car, on the blanket, and on his tshirt, everywhere. The driver could not stop the car as the road was one way and it had a lot of traffic. We managed to change my son’s Tshirt, wiped him… poor baby! he felt much better after that, he sleeps on my lap with his head on my chest. In fact when they booked the villa, it said it has a lift for the luggage, they thought me and the baby can go in lift. Little did they know that it was just a swing like trolley where they tied all the bags with a rope. Now the uphill climb. Husband carries our son. I was covered in dried puke and smelling of it as well, climbing the 110 steps which seemed never ending that time. All the locals are greeting us as we were climbing the steep mountain steps, I wanted to hide my face. The Italians were so smartly dressed, they know to carry themselves so well and here I was in a mess. 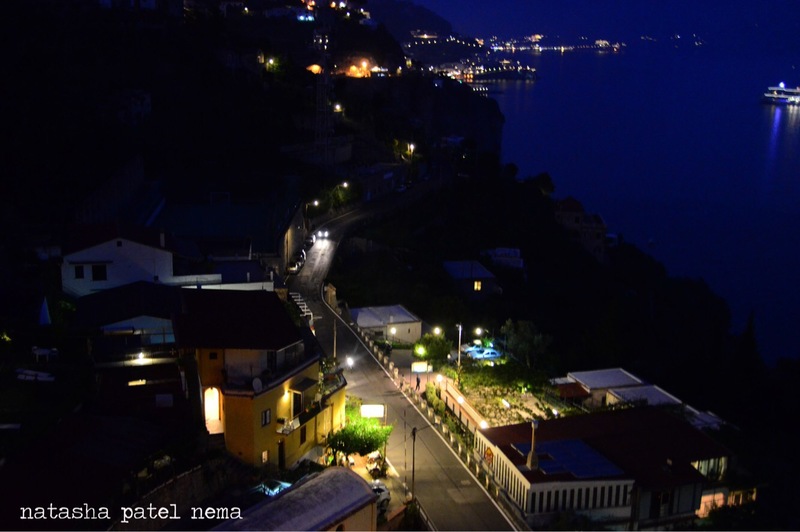 That was the first impression of myself, I gave to Amalfi..
Once I reached the villa we gave our son a bath, then I took one myself and finally put my tired son to sleep. Then I got time to check the rest of the villa.The view was worth the steps. 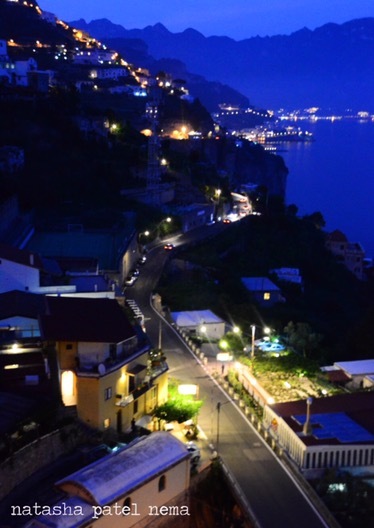 We could see the whole of Amalfi, the sea, the beautiful houses, the lemon trees and the bells of the churches echoing in the distance, it was the perfect place to holiday and unwind. Below where the steps started our villa owner ran a restaurant. It was a typical Italian restaurant run with love and over flowing with all their family members. Everyone including the children and babies would be there. It was also a very well know restaurant there and its food..wow! I don’t think I like Italian food anywhere else after eating for those 5 days at Salvadore’s restaurant. On the last day we were having a family dinner at Salvadore’s restaurant. My son refused to stay in so my husband took him for a walk outside untill I finished my dinner. Then it was my turn. By now my son was sleepy. I was carrying him , walking him to and fro outside the restaurant, thinking may he the motion would make him sleep. There was a white vespa parked, it was almost like a motorcycle, I was curiously looking at it trying to understand what model it was. A typical Italian man (typical means good looking) in white shirt and jeans comes out. Till today I remember his face reason being. Here I am holding my baby in my arms and this man in the white shirt tells me.. I was confused, I thought I heard him wrong, here I was carrying my son and I look at my son, then look at him in disbelief. I never blush when men ask me out, I always act cool. But this time I could not help it, Reason being I was not prepared. You are prepared when men approach you at bars, clubs, parties, airports, gym but you are not prepared when you are carrying your baby and trying to put him to sleep and having a family dinner atleast I am not.. But I was happy that the man asked me out, he was one of the restaurant owner’s nephew helping out at the restaurant. That what I like about European men of course they are good looking and very well dressed but they are up front and straight forward. That man liked me, he told me, me being a mother, married did not matter. Nor did the rejection matter. Later on as everyone’s dinner was done I passed on my son to my husband as he had to carry him up the 110 steps, Mr squash player to the rescue. A day scene from out villa and the yellow restaurant right there..
“… but with all this I was also an individual” – something the smartest, most talented and beautiful women too often forget, having been conditioned to believe it’s the right thing to do, to give oneself up for others. What strange things little girls are taught about the sort of women they should grow up to be.